Signals received by the USRP-2920 are amplified, downconverted, filtered, digitized, and decimated before being passed to the host computer. Signals transmitted by the USRP-2920 are upsampled, reconstructed, filtered, upconverted, and amplified before being transmitted. The RF switch allows transmit and receive operations to occur on the same shared antenna. On the USRP-2920, one antenna is designated receive-only. The low-noise amplifier and drive amplifier amplify the incoming signal. The phase-locked loop (PLL) controls the voltage-controlled oscillator (VCO) so that the device clocks and local oscillator (LO) can be frequency-locked to a reference signal. The mixer downconverts the signals to the baseband in-phase (I) and quadrature-phase (Q) components. The lowpass filter reduces noise and high frequency components in the signal. The analog-to-digital converter (ADC) digitizes the I and Q data. 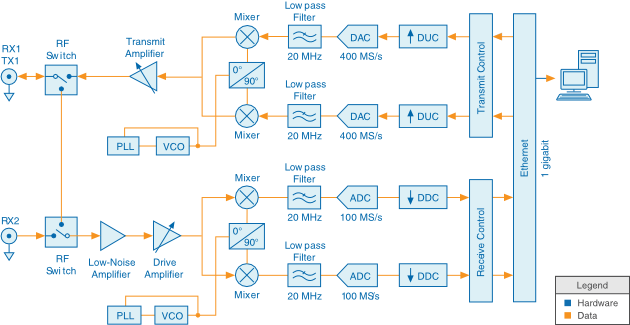 The digital downconverter (DDC) mixes, filters, and decimates the signal to a user-specified rate. The downconverted samples are passed to the host computer over a standard gigabit Ethernet connection. The host computer synthesizes baseband I/Q signals and transmits the signals to the device over a standard gigabit Ethernet connection. The digital upconverter (DUC) mixes, filters, and interpolates the signal to 400 MS/s. The digital-to-analog converter (DAC) converts the signal to analog. The mixer upconverts the signals to a user-specified RF frequency. The PLL controls the VCO so that the device clocks and LO can be frequency-locked to a reference signal. The transmit amplifier amplifies the signal and transmits the signal through the antenna.